Jurin-in temple is located in the former Naramachi area , an old quarter of Nara city , which had developed with Gangoji-temple as a nucleus. It has been reported that Jurin-in temple was founded by ASANO NAKAI , Priest Kukai or Priest Shobo sometime between the late Nara and early Heian period. However , it is more probable to think that this temple was established during the early Kamakura period with a stone image of Jizo-bosatsu as a principle image for worshipping , supported by the folk Buddhism of those days , wishing for the salvation from the Hell and admisison to the Buddhist Paradise after death. 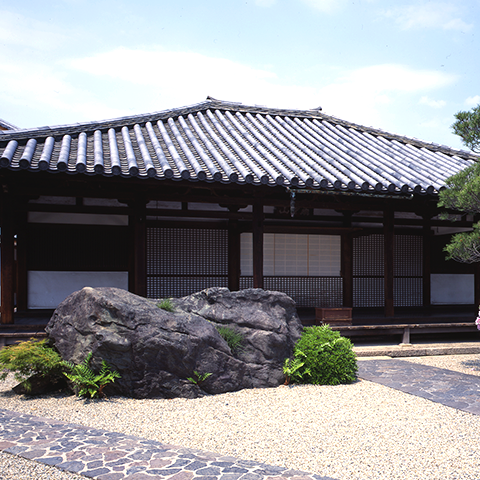 In Shaseki-shu , compiled by a Buddhist monk , Muju , in 1283 , Jurin-in is introduced as one of the noted temples in Nara. A stone platform to place a coffin is found in front of the stone image of Jizo-bosatsu in the temple. It indicates that temple used to serve as indispensable insutitution for people's funeral ceremony. Because of the series of battles during the Muromachi period , most of the temple treasures were lost. But the stone image of Jizo-bosatsu , structures of the Hondo hall and the Nan-mon gate , the statues of Fudo-myo in the Goma-do hall, thirteen- storied stone pagoda , and Sutra repository which was removed and reconstructed in Tokyo National Museum in Meiji period , have survived and they are still extant. These remnants from earlier days prove the well-planned structures of the original temple , which maintained the aesthetics of the Heian period as well as the tradition of the ancient capital Nara. Copyright © JURININ All rights reserved.